After 5 days in a row at the allotment, I’m taking a break today. It has been great to get back to work, even if it’s a bit hard going at the start of the year. We’ve been adding to our raised beds, changing the format of the polytunnel, and much more. This warming soup has been on the go all week. I made a couple of batches. The gentle heat instantly starts working as soon as I have a bowl in my hand, and the fresh bitter greens along with citrus hit from the lemon is a real change to a classic thick blended soup. 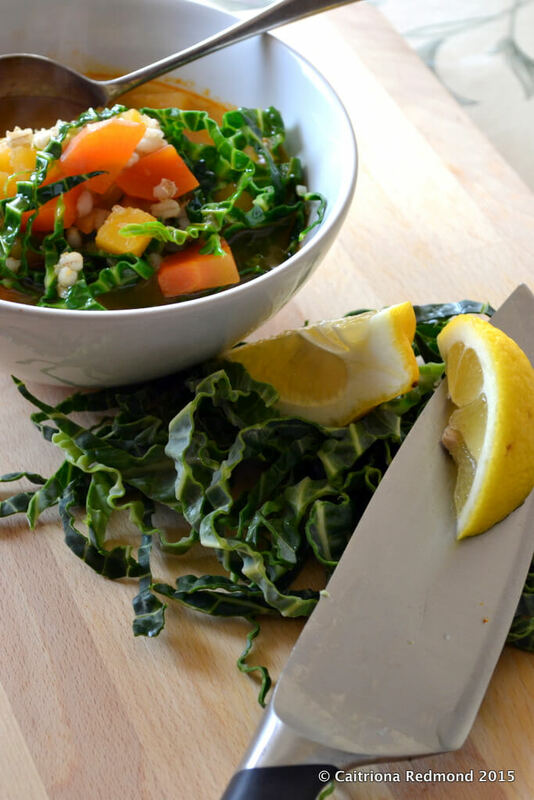 The key to making the soup last is to add the greens just before serving, then a decent squeeze of fresh lemon juice. The base of the warming soup will keep for a little bit longer that way and you keep the fresh, vibrant green colours in the broth. Heat the oil in a large, heavy bottomed saucepan on a medium heat on the hob. Add the onion and stir for 1 minute, next add the garlic and stir again. Cook for 4 minutes. Squeeze in the harissa paste and step away from the saucepan so you don’t inhale the steam – otherwise you’ll get a lungful of spicy steam & make your eyes water! Pour in the pearl barley and stir so that the barley is coated with the paste and begins to toast a little in the heat of the saucepan. Add the chopped carrot and turnip, then pour the water on top of the vegetables and pearl barley. Bring the saucepan to a simmer, then cover and simmer the contents of the saucepan for 20-30 minutes. Once the vegetables are still slightly firm (not mushy!) the soup is cooked. To serve the warming soup, spoon a large ladle of soup into a big bowl, then stir in the fresh greens immediately into the hot liquid so that they wilt a little bit. Squeeze lemon juice on top and eat straight away. As there is pearl barley in the mixture there should be no need to add bread to the dish, although it is nice to dunk if you have some.